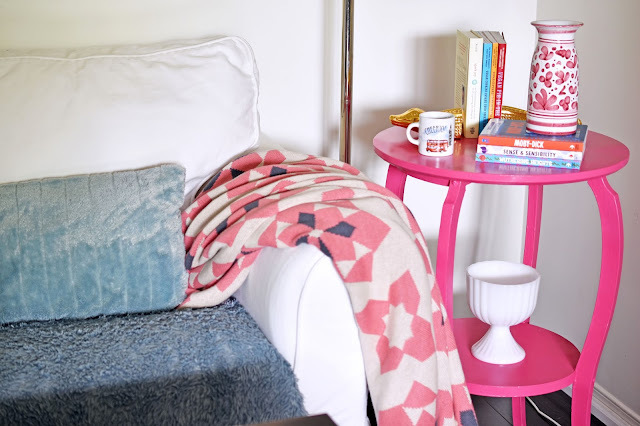 Each month I participate in a diy challenge with 11 other Canadian lifestyle and decor bloggers. We base our projects on a common material for the month. Hard to believe we are in June already! To review, January was about mason jars. February was fabric. March centred on Fusion mineral paint. April was thrifted finds. And May was a crafter's favourite - mod podge. This month, our chosen material is spray paint. 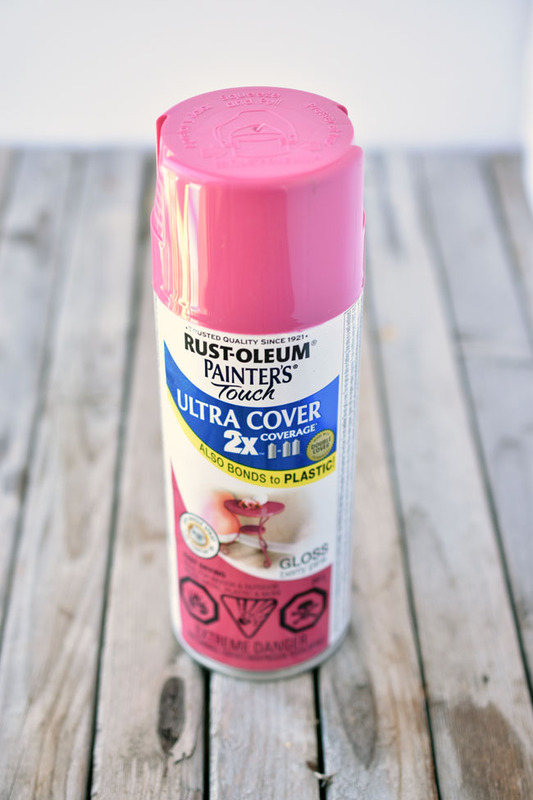 And thank goodness for that, because I hadn't quite realized how many items around this house needed a good refreshing with spray paint! 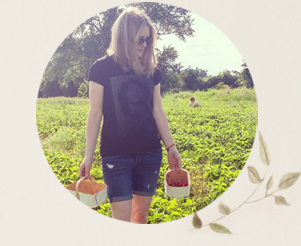 I actually did two projects for June, as we are down a couple of bloggers in our group temporarily. Check out my spray-painted and stencilled terra cotta planter too! 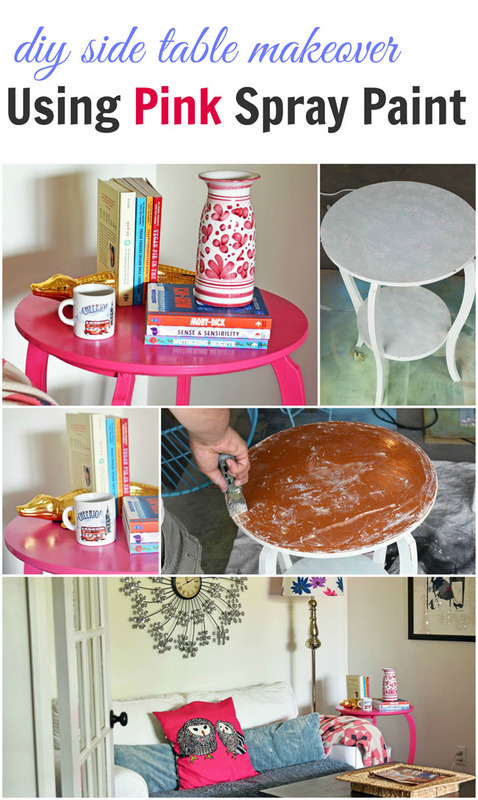 The project featured here is a simple side table spray paint makeover. The fun of it is in the colour. The table, which I found discarded at the curb by a neighbour, was sitting in our home office/living room for quite a while, looking dull, outdated and, dare I say, ugly. As I have several touches of hot pink in the room, on picture frames, accessories and in artwork, I thought I would pick up the same type of pink for the old, dull table. As you can see in the upper left of the collage above, the table had previously been painted with a smooshy white and pale green effect. I suspect that's why it ended up in the trash. I envisioned a quick and simple refresh - a light sand over the current paint, followed by a few layers of spray paint. Unfortunately, we got a bit impatient. I started with sandpaper, then moved onto an electric sanding tool. Then my husband decided to bring out the big guns, taking the belt sander to the tabletop. That's when our quick project became a smidge longer. The belt sander took the centre of the tabletop down to the original, shiny surface. We tried to persevere with our lazy approach. We sanded the paint that was still left on the tabletop lightly, covered the whole thing with white primer and hoped the paint would ultimately hide the uneven areas. As you can see, we got a bit of pink spray paint on and decided that, no, the lazy approach wouldn't work after all. You could see the uneven surface underneath. I know, I know, preparation is the key to success with painting! So we started the tabletop over again, using a liquid furniture stripper to quickly remove all finishes. 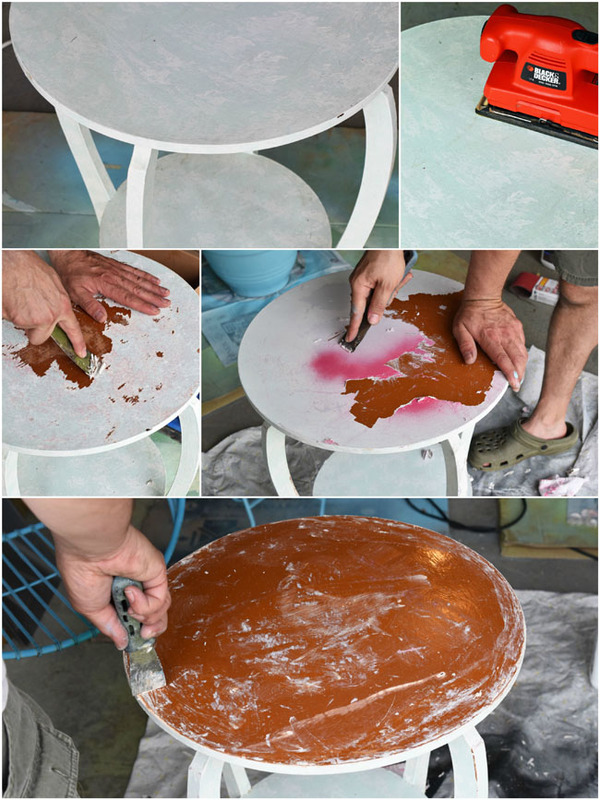 Once that was done, I primed the whole table with white spray primer and then applied about three coats of the berry pink spray paint. 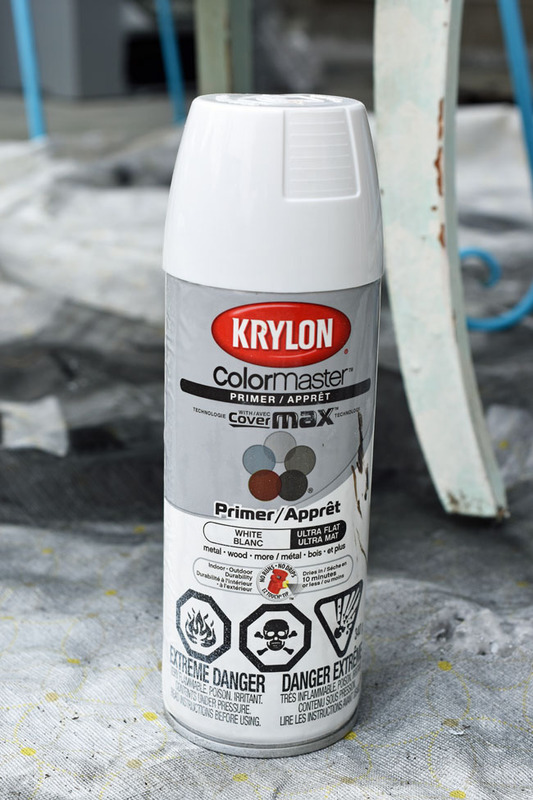 We used two coats of this Krylon ColorMaster white spray primer, because we had it left over in the basement from another project. Here is the finished side table, placed next to the white couch on the living room end of our office/living room. I really enjoy seeing the refinished table when I pass by the room. It has a lot more impact than it did previously, as it hid in the corner covered by a portable record player. Even though it's an inexpensive type of table, I feel satisfaction in re-purposing it rather than sending it to landfill. I accessorized my glossy pink table with some amazingly beautiful finds from O.co (also known as Overstock.com). 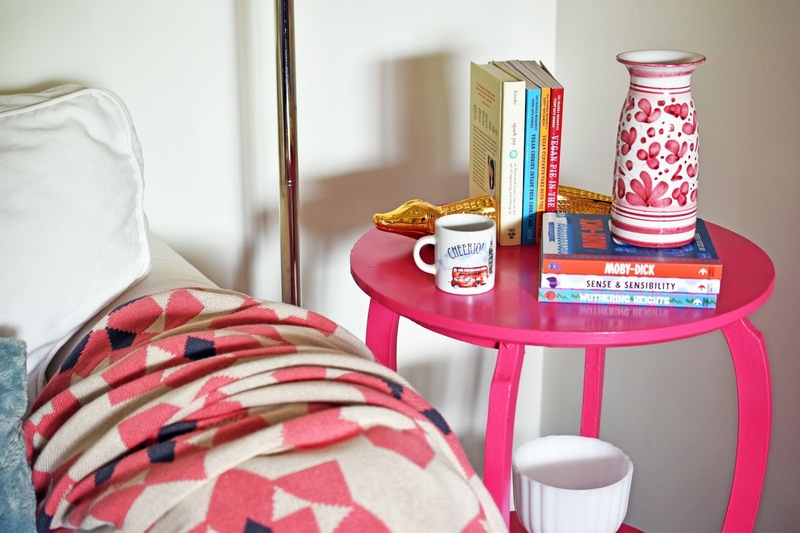 To start with, there's this gorgeous Ellesmere throw from India, which I draped over the arm of the white sofa next to the table. I cannot even explain to you how great this throw feels to the touch. (I wish you could feel it through your screen.) It's soft and stretchy and as comforting as a hug. 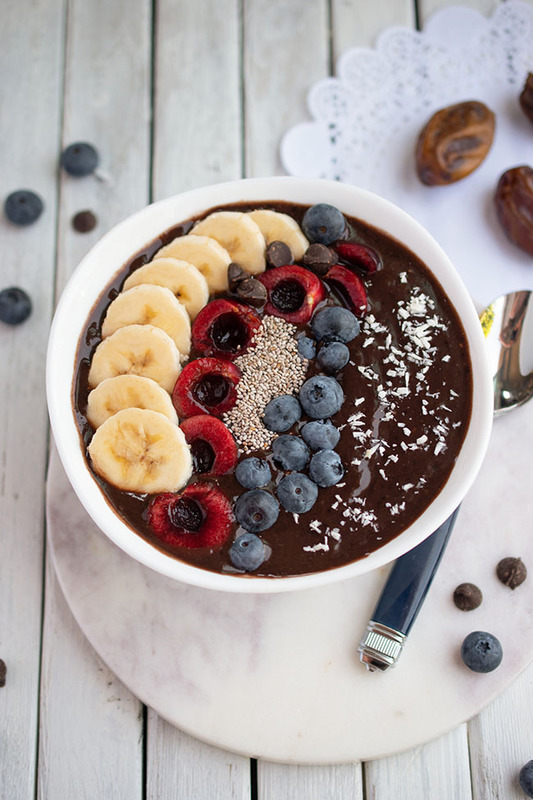 It begs to be shared with a loved one. 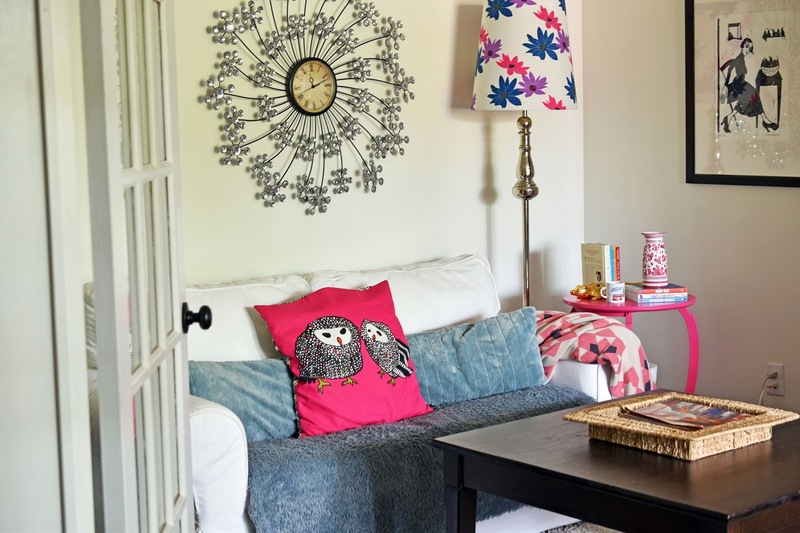 And it has such a pretty pattern and colour scheme (focusing on pink, naturally). I am equally as fond of these gold tone alligator bookends. 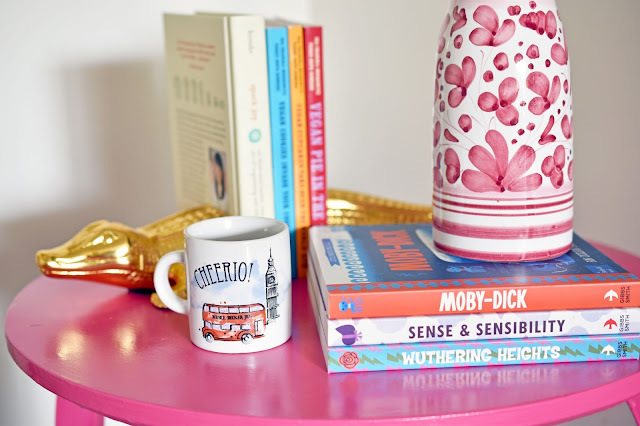 They are a perfect whimsical note for my vibrant pink table. Do you see the alligator's tail on the other side of the books? The alligator's low profile is perfect for small books and the glossy gold makes it a fun decor accent. Also the perfect balance of stylish and whimsical are these Coffee Shop by Boston Warehouse S/4 espresso cups. Bonjour! Cheerio! Hello! Buon giorno! 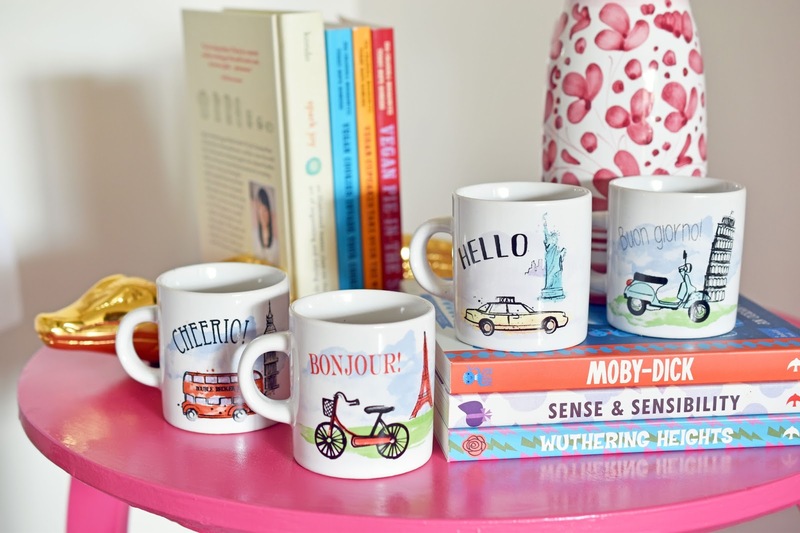 These espresso cups offer greetings in four different languages, with cute illustrations to match. I don't even drink espresso - I just wanted these cups because they are so darn adorable. We will indeed use them when my Italian mother-in-law comes over though. She likes to end a meal with espresso made on the stove. 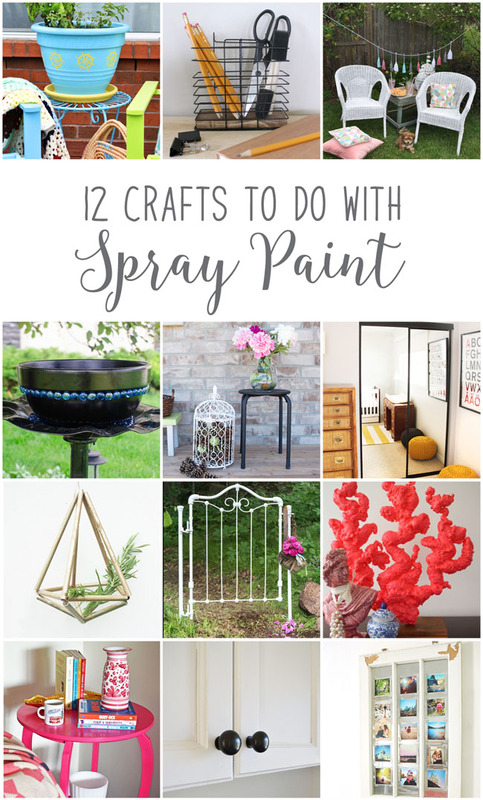 Now it's time to see the rest of the DIY spray paint project ideas from my talented Canadian blogging friends! Repurposed Antique Crib DIY Secret Garden Gate from Vin'yet Etc. *I received products from O.co to facilitate this post. All opinions are authentic and my own. Thank you for supporting the awesome companies that partner with Woman in Real Life. Ooh, I love the hot pink gloss, great makeover! I am in the same boat with a current project (a stool). Layers of paint, plus some weird thin wood glued on the top of the already wood stool! It's a nightmare. we were just discussing taking up a spray painting project! The colour is beautiful! I refinish my kitchen table and sand it all off, it took hours, I was reluctant to use stripper. The sanding can be tedious Carole. I understand your reluctance about the stripper though. I find the one we used easy and not smelly at all. 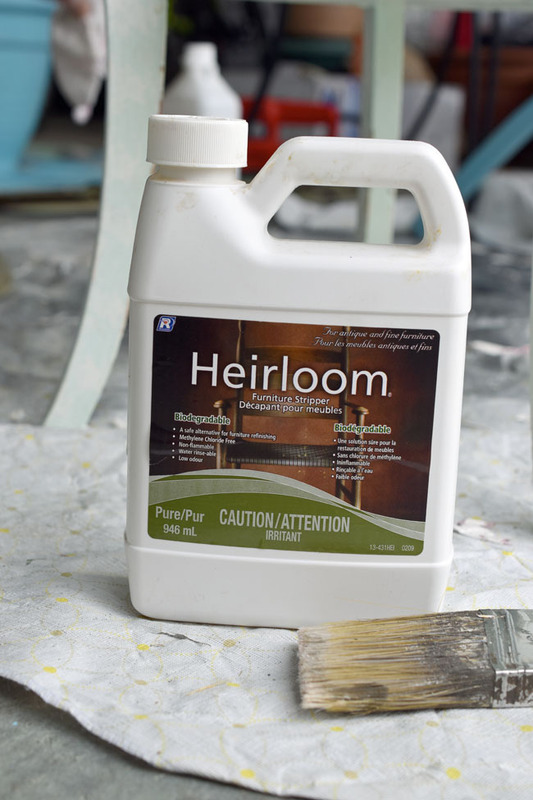 I didn't know about Heirloom furniture stripper, I totally need to get some for a couple pieces of small furniture I was handed down from grandparents. The table looks great, well done! I find it helpful. Good luck with your pieces! I'm happy you like the colour Andrea. Thank you!